So, seems something is going on with 5.3 release. Given this release fixes the HDPi support (for me), it may be that the responsiveness issue is related. Strangely, starting from 5.4, HDPi support is broken again (for me), but the responsiveness isn't fixed. Sadly, from this quick investigation, I see that there is no release with both responsiveness and HDPi support for me. Any hint out from those new elements? Anything I can test out? Tried to run 5.3 version without 3D view (adding -Dcom.eteks.sweethome3d.no3D=true argument), but the responsiveness issue is still present. Also tried to pass -Dcom.eteks.sweethome3d.resolutionScale=2 to version before 5.3, but it does not seem to apply. Slowness that appeared suddenly is an issue here. What can an ordinary user do within the usual administrative tools for Windows and Java? Seems to be working OK now, since yesterday! Have done/changed nothing. Happy to receive a comment or explication, though! I'm looking forward to reading your comments to be able to modify the FAQ accordingly. For me, Sweet home 3d was crashing right from the start with "fatal error (...) update your driver/directx". I tried this and it works wonderful! Anything else I tried doesn't work, but this worked, in that exact combination (tried it one without the other and was still crashing). 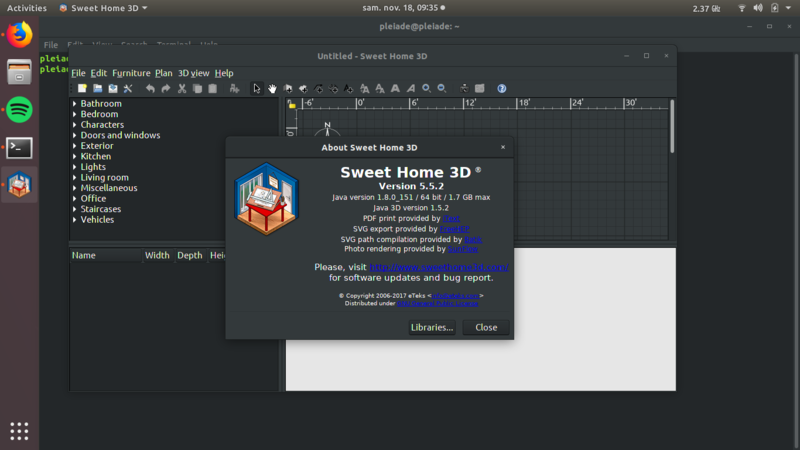 From a recent discussion with Java 3D maintainers, there seems to be a solution to run Sweet Home 3D under Windows 10 64 bit on old Intel processors with integrated graphics. unzip it and execute the install.cmd it contains. Please, try it and report how it worked for you. have the same problem right now. Using Windows 10 on a Laptop with Intel HD Graphic 4000. The 3D view is laging as hell and i installed Java 3D after this it seem to befixed for around 15 Minutes. The 3D View worked nice but than lags again. I dont know what to do now. Have tried Puybaret tip with the legacy igpu thing but without any effect. My company is developing an app base on Java3D as well. We found out that disabling double buffering on the 3D Canvas helped to resolve this problem. Hope this helps. in order to reinstall from scratch my new SH3D version. While my previous 5.7 plain installation did terribly slow down on 3D rendering, this installation mode competely fixed any issue. I operate on a laptop with Windows 10 home 64 bit and a 3 years old Intel core i7 cpu. I also noticed that after reintalling SH3D, it reserves just one third RAM than before.